UCF Football has plenty of big games coming up in 2018. 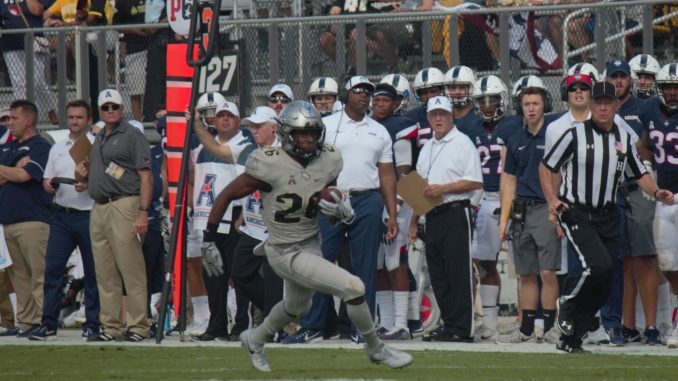 The Knights are set to match up with two ACC teams, Lane Kiffin’s feisty FAU squad and will have to take down tough AAC foes such as Memphis and USF if they hope to go undefeated again. But, surprisingly, the team’s most important game just might end up being its season opener against lowly UConn. No, this has nothing to do with “the ConFLiCT” or any other made up rivalry. It doesn’t even have anything to do with UCF’s conference championship hopes. To understand the importance of the UConn game, Knights fans will have to dwell on a gut-wrenching scenario: what if UCF went undefeated again – and didn’t even make it to a New Year’s Six Bowl? Sounds crazy, right? It’s a lot more possible than you think. The national media has not exactly been UCF’s friend in the months following its national championship claim. Even though the Knights returned almost every piece of the best offense in the nation, most preseason Top 25 polls have them very low, if ranked at all. In fact, the national consensus is that Boise State is the best bet to represent the Group of Five in a New Year’s Six. The Broncos will almost certainly be ranked ahead of the Knights to start the season, and they are expected to be talented enough to make a run at an undefeated year. Given how easy its schedule is, Boise State going 13-0 really isn’t that unlikely at all, and this could be a huge problem for UCF. The College Football Playoff’s rules are very clear: only one Group of Five team gets to a major bowl. That’s it. In fact, if a Group of Five team managed to make the Playoff, another team still wouldn’t be eligible to take their place in a non-semifinal bowl. So, if UCF starts the year ranked behind Boise State, it may never be able to catch up. Yes, the Broncos’ schedule is ridiculously easy but given how much the Knights have pissed off the CFP Committee, it really wouldn’t be all that surprising to see it keep UCF behind Boise State, as long as the latter doesn’t lose a game. In that scenario, as strange as it sounds, the Knights could go 13-0 and end up playing in the Birmingham Bowl or Cure Bowl. This is why it’s incredibly important that UCF puts everything it has into its game against UConn. Why? Because Boise State is playing them this year as well. If the CFP Committee ends up having to choose between two undefeated Group of Five teams, what better measuring stick than looking at their results against the same opponent. Yes, the Knights are heavy favorites against the Huskies, but they have to do more than just win. They need to crush them so convincingly and effectively that it won’t matter what the Broncos do to them a week later. UCF simply can’t take that game off or try to just coast to a win. If it does, the team’s New Year’s Six hopes may be dashed by September.